We have just added a new feature to our sold price search where you can now see sold prices for any property across England and Wales with not only the sale price, but the sale price converted to today's money using RPI and Salary indexes. These figures are also joined by mortgage estimates based upon an 85% repayment mortgage being taken out on the property at the time of sale using typical rates offered by banks and building societies at the sale date. When adjusted for inflation, the changes in value over time - major or minor - are extreme when looking at the buying power of the money at the time of sale and comparing to today at each step. 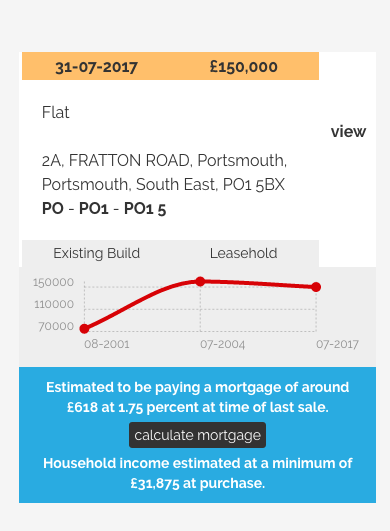 Taking the following example we see a flat in Portsmouth (plucked at random) last sold in July 2017 for £150,000. Two previous sales were recorded, one in 2004 at £160,000 and another earlier in 2001 at £75,000. This shows a steep jump between 2001 and 2004 of £85,000 but a minor drop of £10,000 between 2004 and 2017. However, once RPI inflation is factored the £10,000 drop between 2004 and 2017 is around £80,000. £160,000 in 2004 was worth £233,000 in today's money in buying power. Whereas, well £150,000 now is worth £150,000! The mortgage on £160,000 back in 2004 was £1,208 per month when converted to today's money whereas someone mortgaging the same property in 2017 amounts to paying £525 a month. This is due to inflation as well as the drastically different interest rates between the two periods - 6 percent in 2004 and only 1.75 percent in 2017. You can search any property using the sold house prices tool and see the same type of figures across millions of other properties. We also estimate the household incomes of the occupants at time of sale and show the type of resident based on census data. Remember, we have tools across the site to help sift through every area across the UK based on crime, jobs, travel, house prices, education and more.